We are proud to offer locks in a variety of configurations from top manufacturers like Locinox, Lockey, Master Lock, Kaba, and More! We offer Keyed Locks, Keyless Locks, Pad Locks, and Electric Locks, along with accessories and replacement parts for them. Below is a brief introduction to our offerings, more specifications and details can be found on the product pages. 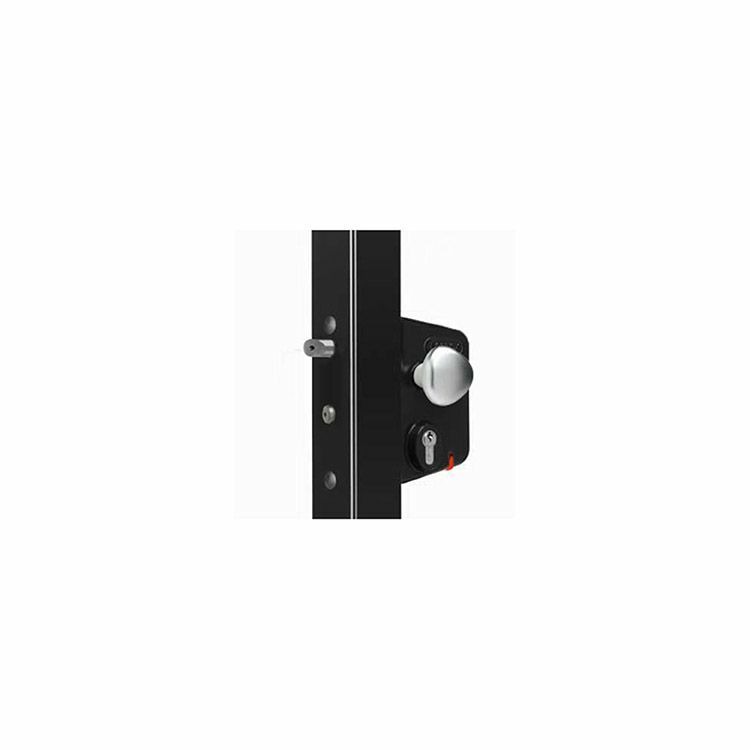 Industrial Gate Locks - These gate locks are the perfect finishing touch on any industrial gate. When paired with a round post adapter, this lock becomes our chain link lock, which is adjustable and comes in 3 sizes so getting the right one for your gate frame/gate post combination is easy. All industrial gate locks come with a dead-bolt that is keyed from both sides. Latch bolt and deadbolt are adjustable after lock is mounted. Easy to open aluminum levers make opening them a breeze. The specialized Chain Link Holder is a neat piece of hardware for fitting the lock in the fabric. Lock cylinders are LORI which means you can retrofit one of your custom cylinders (Yale cylinders only). Ornamental Gate Locks - We stock locks for square gate frames and square latching posts. All sizes are available in black, some sizes are also available in aluminum. 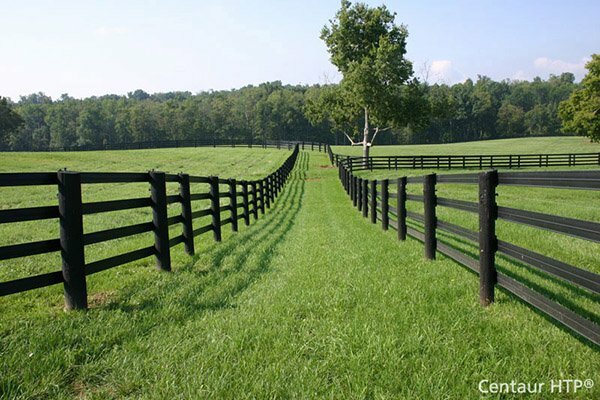 The locks are perfectly suited for your Jerith, Ultra, and Ideal fence. 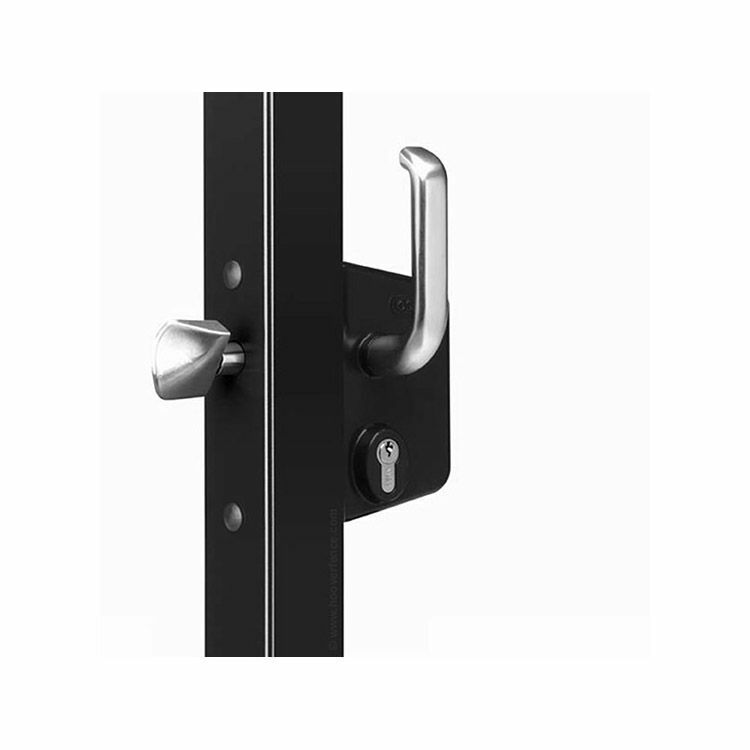 Two styles of handles used on these locks, black ornamental style and aluminum style. Lock cylinders are LORI which means you can retrofit one of your custom cylinders (Yale cylinders only). Latch bolt and deadbolt are adjustable after lock is mounted. 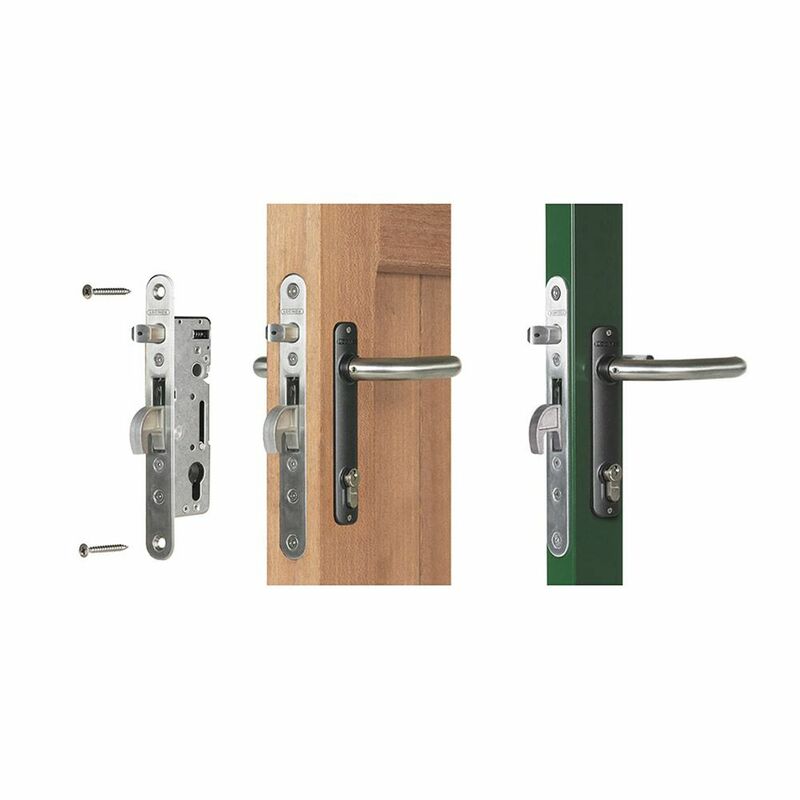 All locks available with handles on both sides, kits available to convert lock to single-handle style. Locks with one handle can be opened with key only from side w/o handle. 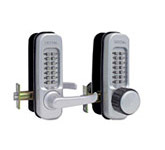 Sliding Gate Locks - Sliding gate locks are designed for square profile gates that are being operated manually. Key lockable. Available in black and aluminum finish. Size of catch bolt dictates the lock to be ordered. Comes with "S" type aluminum handles. Stainless steel mechanism, catch bolt, fasteners, and keeper for long life. Minimum latch post size of 1-1/2". Extremely strong and weatherproof. Three keys provided. The keyed lock cylinders are LORI which means that you can retrofit one of your custom cylinders (Yale cylinders only). Adapters available to use this lock on round profiles also (chain link). 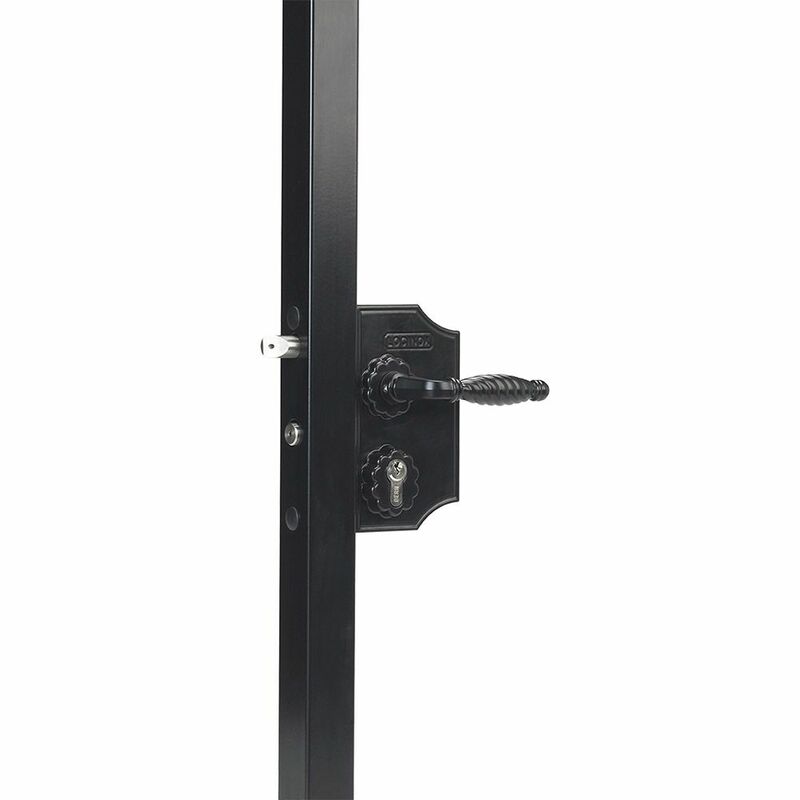 Mortised Insert Gate Lock HYBRID - The HYBRID gate lock is designed for to be mortised into wood, metal, or vinyl gates. All the typical features available as most other Locinox locks including stainless steel mechanism, hook, front plate, and latch bolt for long life. Combination of hook and latch bolt provides secure anchoring. Polyamide cover protects lock mechanism from dirt and debris. Kits available as well as separate components to build your own custom lock. Weld box available to fabricate into existing gates. Three keys provided. The keyed lock cylinders are LORI which means that you can retrofit one of your custom cylinders (Yale cylinders only). Swimming Pool Gate Lock - Swimming pool gate lock is designed for square profile gates measuring 1-1/2" only. Lock style slides inside the gate upright. Key lockable. Casing and knob made of powder coated aluminum and Polyamide. Stainless steel mechanism, roller bolt, and fasteners for long life. Minimum latch post size of 1-1/2". Keeper is Polyamide construction. Lock and keeper is strong and weatherproof. Three keys provided. The keyed lock cylinders are LORI which means that you can retrofit one of your custom cylinders (Yale cylinders only). This lock was designed for child safety and meets most pool codes when installed properly. See your local pool code to assure this will work for your application. Garden Gate Lock - Garden gate locks are designed for square profile gates that are being operated manually. Key lockable. Available in Polyamide (plastic) black finish only. Comes with Polyamide (plastic) style handles. Stainless steel mechanism, catch bolt, and fasteners for long life. Lock fits 1-1/2" profile only, lock is not adjustable. Minimum latch post size of 1-1/2". Keeper is 1-piece Polyamide construction. Lock and keeper is strong and weatherproof. Three keys provided. The keyed lock cylinders are LORI which means that you can retrofit one of your custom cylinders (Yale cylinders only). Economically priced with Locinox quality. Electric Gate Locks - These gate locks offer security by electronic control. Access control devices can be wired to this lock to control the latch. The deadbolt operates by key only to lock down the gate for everyone. Latch and deadbolt can be operated by the key. Available in black only. Designed for ornamental gates with flat posts but can also be used on round posts with adapters. Latch bolt and deadbolt are adjustable after lock is mounted. Standard aluminum round handles operate the latch. The latch bolt automatically resets after opening, providing a convenient 'self-locking' feature. The keyed lock cylinders are LORI which means that you can retrofit one of your custom cylinders (Yale cylinders only). 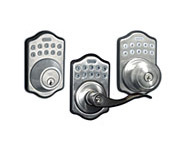 2900 Series Narrow Stile Locks - Mechanical keyless locks with round knobs and lever handles. 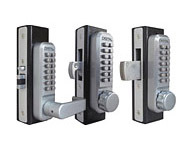 Locks come with capability for single access codes from 2 to 7 digits. Locks are easily programmed and easy to install. 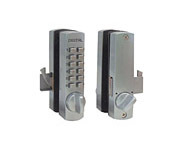 Double sided combination locks available that require pushbutton codes to open from either side. Locks are changeable for left or right handed doors. Locks mortise into narrow stile doors such as storefront glass doors. Lock boxes available for fabricating into chain link gates. 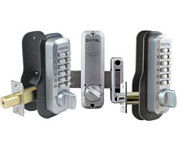 Locks are available with Adams Rite latches, and laminated hardened steel deadbolts and hookbolts. 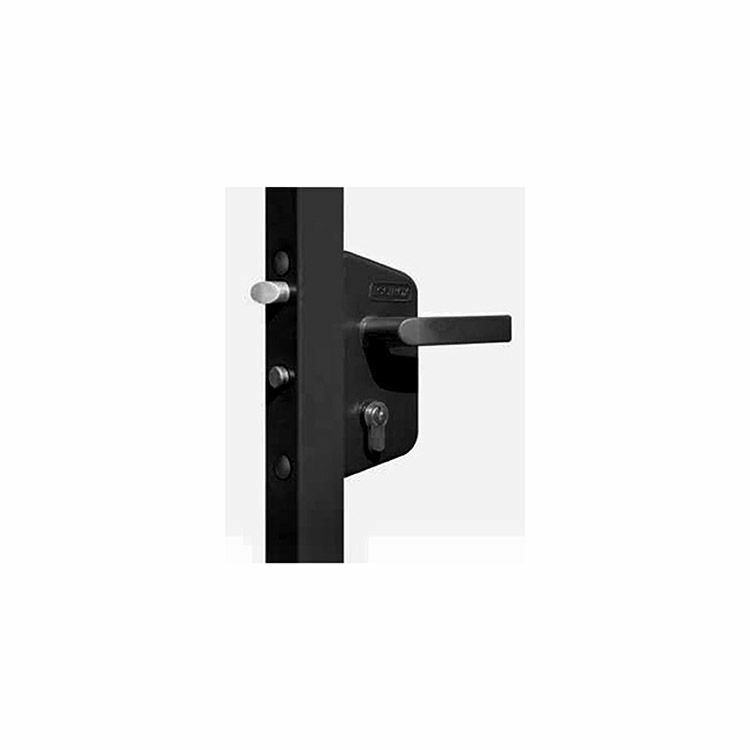 Narrow stile lock come in a wide variety of finishes. 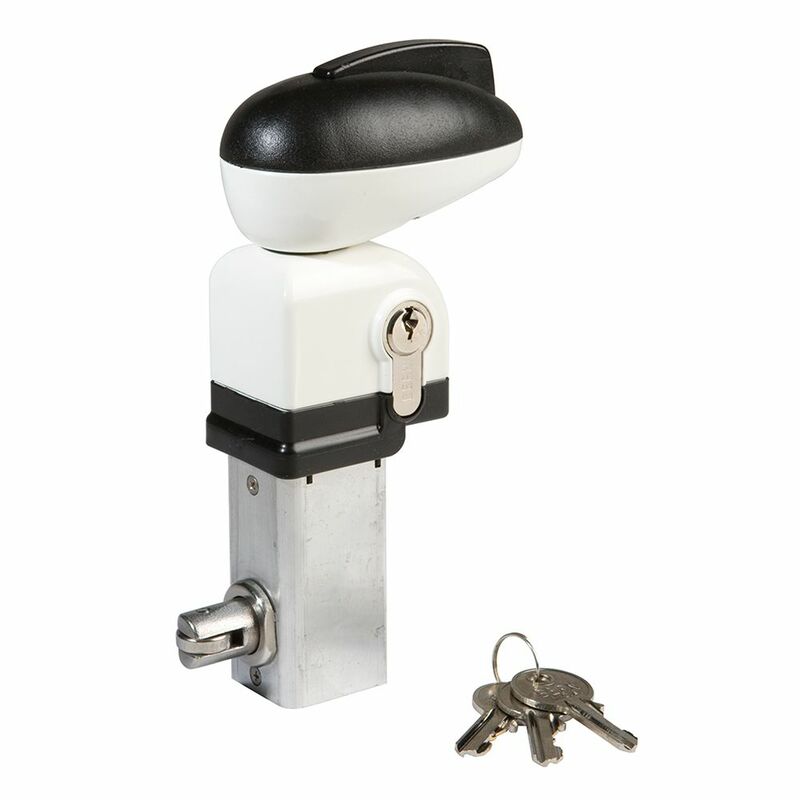 3000 Series Heavy Duty Marine Grade Locks - Mechanical keyless locks with oversized round knobs and Marine Grade finish for long lasting performance in harsh environments including salt water exposure. 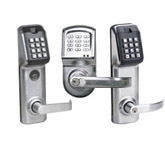 Locks come with capability for single access codes from 2 to 7 digits. Locks are easily programmed and easy to install. Double sided combination locks available that requires pushbutton codes to open from either side. Locks are changeable for left or right handed doors. Lock boxes available for fabricating into gates. High security locks are available with deadbolts or spring latches. Comes in Marine Grade finish only which resembles the Satin Chrome finish only with added protection against the elements. 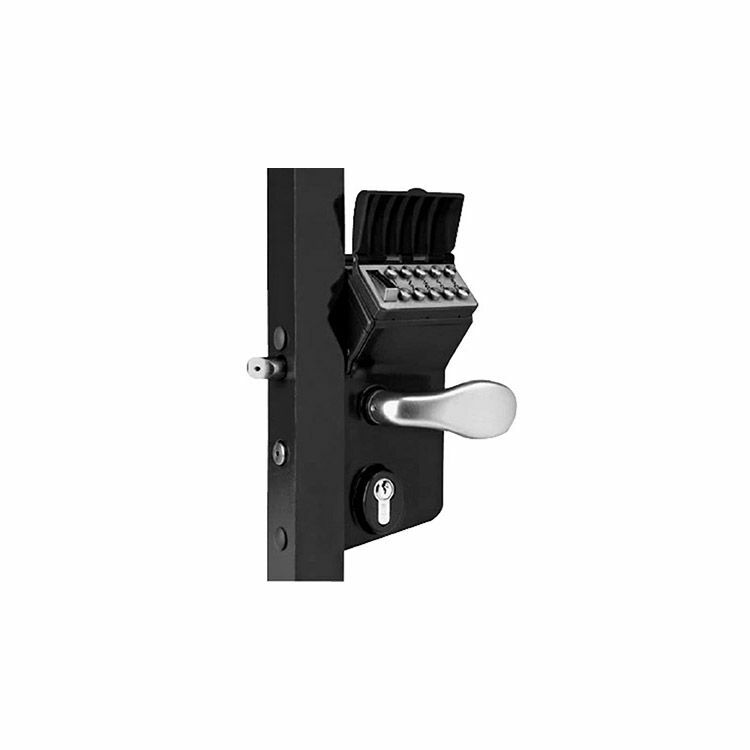 M-Series Compact Locks - Compact and economical mechanical keyless locks with thumbturn round knobs on both sides and combination on outside. Locks come with capability for single access codes from 2 to 5 digits. Locks are easily programmed and easy to install. Double sided combination locks available that requires pushbutton codes to open from either side. Locks are changeable for left or right handed doors. Lock boxes available for fabricating into gates. High security locks are available with deadbolts or spring latches as well as a surface mount deadbolt model. Available in a variety of finishes: Antique Brass, Bright Brass, Satin Chrome, Bright Chrome, Satin Nickel, Jet Black, White, Oil Rubbed Bronze, and Marine Grade (special finish for salt water exposure). 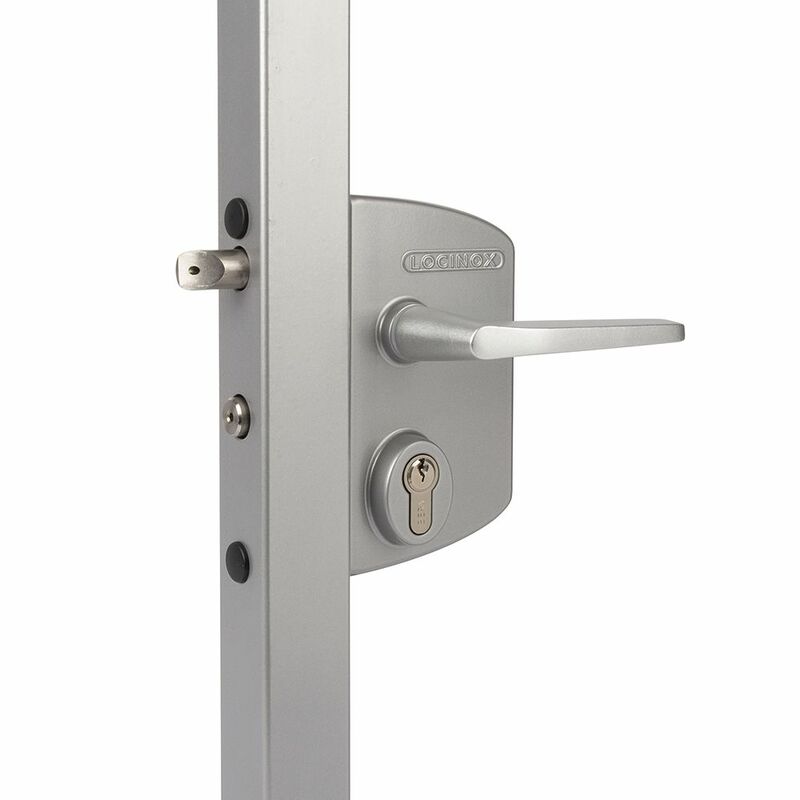 C100 Series Compact Locks - LockeyUSA continues to expand it's product lines with the introduction of the C100 series locks. The C150 is the first lock in this series, the smallest Lockey makes. The lock is a light-weight hook bolt cabinet lock that can be used on a large variety of applications. The surface mount lock is a bump proof, pick proof lock that is Teflon coated for weather resistance. It requires no lubrication or maintenance. These locks are ideal for securing sliding glass doors, childproofing homes, bi-fold doors, cabinets and more. The C150 carries a manufacturer's Lifetime Mechanical Warranty on the mechanics of the lock. The C150 locks can support from up to a 5 digit length code. Available in choice of finishes: Antique Brass, Bright Brass, Satin Chrome, Satin Nickel, Jet Black, and White. E-Digital Series Locks - Electronic keyless locks consist of a deadbolt model and two spring latch models with either a knob or lever handle. Locks come with capability for six user codes from 4 to 10 digits. Locks are easily programmed and easy to install. All locks are "remote ready" meaning they can be opened by an optional remote if desired. Locks are changeable for left or right handed doors. Features illuminated keypads, auto-stop and auto-lock function, and both audible and visual confirmation. Available in a variety of finishes: Antique Brass, Bright Brass, Satin Chrome, Satin Nickel, and Antique Bronze. Locks operate on four AA batteries with no messy wiring. Mechanical Code Locks - These gate locks offer additional security and operability with entry by key or programmable code. They are available in black and silver, and can be used on either aluminum or chain link swing gates. Latch bolt and deadbolt are adjustable after lock is mounted. Standard aluminum club handles allow for easy opening. The latch bolt automatically resets after opening, providing a convenient 'self-locking' feature. The keyed lock cylinders are LORI which means that you can retrofit one of your custom cylinders (Yale cylinders only). Also available is a Free Exit version with code entry on outside only. 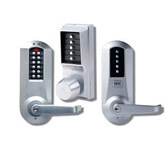 Simplex 1000 & 5000 Series - Mechanical pushbutton locks with lever or round knob handles. Models with single access codes and models with up to 100 codes. Locks are easily programmed via keypad without removing lock from door. Double sided combination lock available that requires pushbutton codes to open from either side. Factory handed for left hand doors, easily field reversible. Electronic pushbutton locks also available. Satin Chrome finishes on all. Lock boxes available for fabricating into gates. 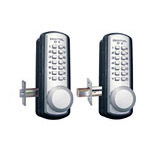 Linear Keyless Locks - Electronic keypad locks with choice of two lever handles. Locks can be programmed to accept up to 120 access codes. 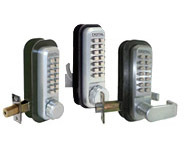 All locks are ANSI compliant and are designed for commercial applications indoor or outdoor. Access decisions are made at the door, no outside source wiring required. Locks are powered by 4 AA batteries with battery life lasting up to 5 years without replacements under normal use. Key override is featured on all locks for emergency situations. Included are cylindrical, deadbolt, and mortise locks. Locks retrofit most existing applications as replacements.